The traffic’s busy, driving through Cambridge to pick up my sister Danielle from the village where she lives. By the time we return to my house, my husband is already welcoming early visitors to his studio. I hastily park the car and Dany rushes indoors to hang her prints, arrange tea-towels and cards. Phew – we’re ready just as the first viewers step over the threshold. This year, more than 350 Cambridgeshire artists are opening their studio doors to the public in July. My husband Iain had a forty year career in science and technology. He has always loved glass, for its colour, translucency and combination of durability and fragility, and its opposing qualities of solidity and liquidity. A few years before he retired, he bought a glass kiln and installed it in our garage. It isn’t practical to make blown glass in the average home because you need a large furnace that operates at very high temperature, so Iain taught himself to make fused glass. 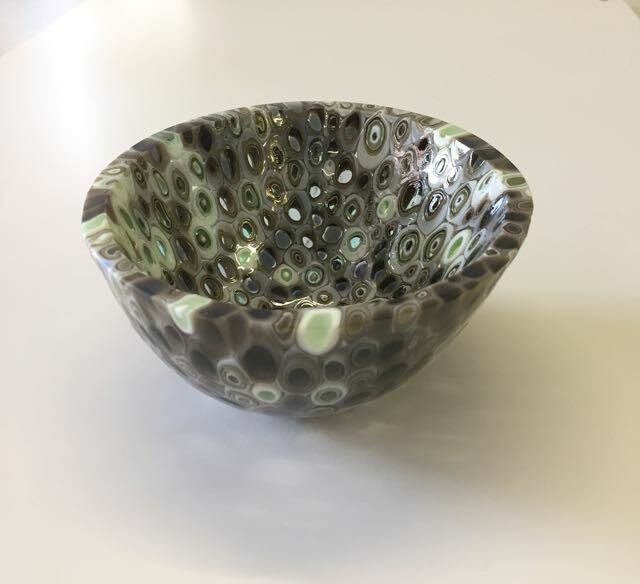 He cuts pieces of glass, uses heat to fuse them together in the kiln and then shapes the flat piece over a mould to make bowls, plates and other objects. He also constructs stained glass panels. He attended courses to improve his technique, and then, once he had built up a body of work, signed up for Cambridge Open Studios. Back in 1975, I married a scientist – but now I’m married to a craftsman/artist. I’m used to Iain rushing out of the house at any time of the day or night to check the kiln. We pore over pieces of glass, working out new and attractive colour combinations. When we go on holiday we make a point of visiting galleries and buildings that contain remarkable glass – the Lalique glass St Matthew’s Church in Jersey; the Art Nouveau and Art Déco Museum in Salamanca, with its wonderful collection of glass by Emile Gallé, the Daum brothers and Lalique; the stained glass in the Horta Museum in Brussels; a Tiffany museum in Florida. Last year, my sister, who is a printmaker, joined Iain for Open Studios. Which means that for three weekends in July part of our home turns into an art gallery. Wellingtons, a work-bench and other items Iain has cleared out of the garage now clutter my tiny greenhouse. Inside the dining area, our own pictures are taken down so that Dany can hang her prints. There are command hooks on the walls, the cupboard doors and even the radiator. All the stuff you usually leave out on kitchen work surfaces – food processor, notepad, bowls of fruit, onions and tomatoes – is hidden away in some other part of the house. The rooms are subject to the sort of clean you do when you’re putting the house up for sale. I sort out the front garden – with perhaps getting on for two hundred people visiting during the Open Studio weekends, we need to look our best. My function is to make tea and coffee and to feed the artists with the food I’ve bought in from M & S – it’s impossible to cook in the kitchen. There are hours when no one comes and hours when a dozen visitors arrive at once. Cambridge is a cosmopolitan city and people from many different parts of the world visit the studios. We love having visitors of all ages, from babes in arms to tiny, fragile-looking old ladies. 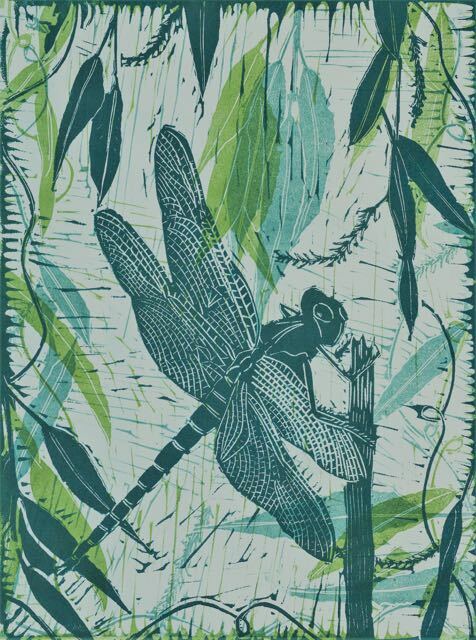 Some are glass artists or printmakers themselves, keen to see how others practise the craft, and others work in entirely different spheres but enjoy spending their weekends looking at beautiful objects. It’s lovely meeting so many interesting and appreciative people. By six o’clock on the final weekend, we’re all tired and breathe a sigh of relief as the last visitors say their goodbyes and leave for home. The prints are taken down and ferried back to Dany’s house. At home, Iain and I pour ourselves a drink. The food processor and fruit bowls return to their usual places and we hang our paintings back on the walls. The garage slowly slips back into its customary disarray. Open Studios is over – until next year.